Choose the best way to spend your time and play with Oggy! There are so many obstacles, but he really want to eat it! Defend you plate from all of them! Be fast enough and you will be the winner of this game! Be sure that you will cope with it! This is the sequel of game series about Oggy and Cockroache. Are they or favorite characters? So let us play with them funny game! 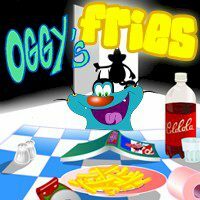 You have to use Oggy's fist to hit the cockroaches before they steal one of your twenty fries. As better your hits will be. So more points you can get! When they does a flyby air raid on Oggy's plate be sure to punch him out as well for even more points. There is the only one way to win! Keep an eye on jack's hand when it comes out to grab your whole plat of munchies. Have a fun!